Viruses can plague your computer, causing it to act weird, run slowly, and even crash. Viruses are programs that can be very harmful to your computer. They are spread through a variety of means including through emails, adware, and even through flash drives. If you somehow end up with a virus on one of your flash drives, you can remove it just as you can remove one from your own computer. Follow the steps below to do so. Step 1: If you think you have a virus on a flash drive, run a virus scan program to make sure. If you find that there is a virus on the drive, you can try deleting it. The problem is that you may not delete the entire virus. Step 2: Before you go any further, you should backup all of the files that are on the flash drive that you want to keep. This will take some time. You cannot copy directories because the virus may be hidden in one of the files inside. Don’t save zipped files either. Open them and extract all of the files that you want to keep. Save everything you want to keep onto a different drive. Step 3: Now, you can format the flash drive. This will eliminate all of the other files remaining and restore the drive to its original state. You will click Start and then Run. Type cmd into the dialog box and hit Enter. Step 4: When the dialogue box appears, type in Format and the letter of the drive where your flash drive is. For example, type Format E if the flash drive is in the E drive. 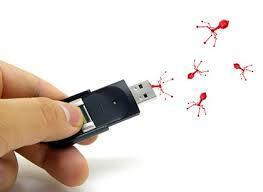 This removes the virus from the flash drive. You can now go back and save all of your backed up files back to the flash drive. remove Google's "Tap to Speak" half screen, which replaced keyboard entering for Message texting? I have LG phone, charger pod is damaged. Can I remove the battery and charge it then put it back in? Safe mode is on, no idea how I have got that on but don't know how to remove it. How can remove virus in my memory card and recover my images from it? ?